It was produced in greater numbers than any other tank of the period, with more than 11,000 manufactured. During the 1930s, the USSR developed a record number of 53 variants of the T-26, including different combat vehicles based on its chassis (flame-throwing tanks, combat engineer vehicles, remotely controlled tanks, self-propelled guns, artillery tractors, armoured carriers). Twenty-three of these were series-produced, others were experimental models. The T-26 together with the BT was the main tank of the Red Army's armored forces during the interwar period. Though nearly obsolete by the beginning of World War II, the T-26 was the most important tank of the Spanish Civil War and played a significant role during the Battle of Lake Khasan in 1938 as well as in the Winter War in 1939–40. The T-26 was the most numerous tank in the Red Army's armored force during the German invasion of the Soviet Union in June 1941. 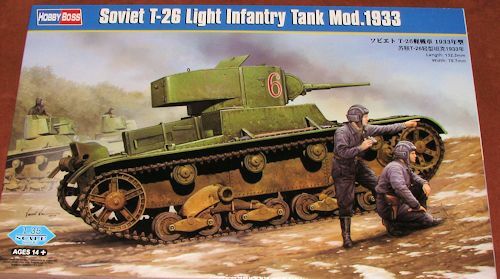 The T-26 participated in combats with the Germans and their allies during the Battle of Moscow in winter 1941/1942, the Battle of Stalingrad and the Battle of the Caucasus in 1942–1943; some tank units of the Leningrad Front used their T-26s until 1944. The Soviet T-26 light tanks last saw use in August 1945, during the Soviet invasion of Manchuria. Initial tanks had twin turrets. The 1933 version was the first with a single cylindrical turret. This turret was bolted together as was the norm. A later modification had a welded turret. 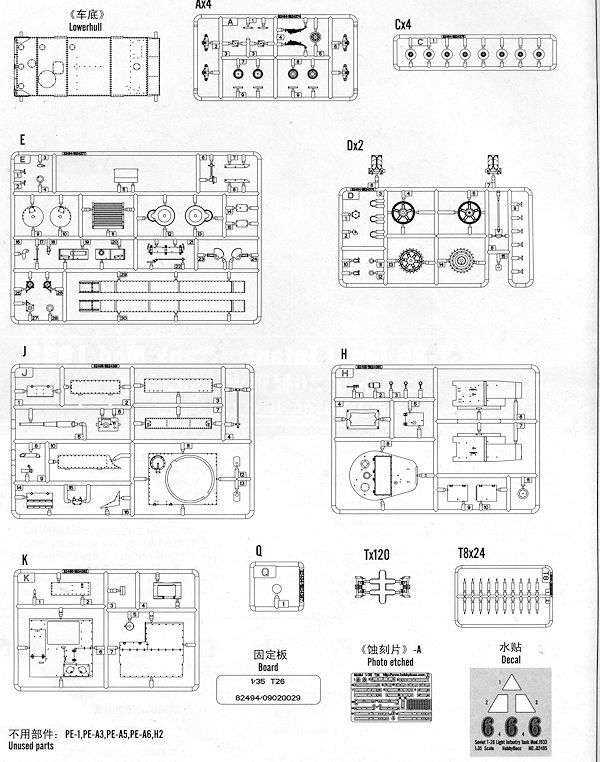 This is another very nicely molded Hobby Boss armor kit. 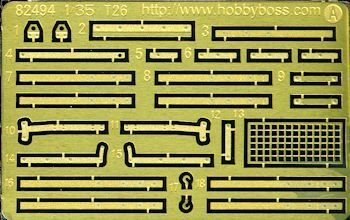 It comes with mostly dark green sprues with the track bits being in dark tan. A one piece lower hull is provided as is a working suspension. Each of the various suspension bits is installed using plastic pins, which have 'no cement' notes that should provide full articulation once complete. This is also true of the individual track links and I do not think I would be far from wrong in stating that most of the parts count is involved in the tracks. In with the bag of plastic track links is an alignment board that allows the links to be held in place while they are pinned. These sorts of pinned plastic tracks are very much one of the more recent developments in separate link technology and everyone I have talked to about them really likes the way they work. The kit also inclu des a nice photo etch fret. This fret is mostly for the engine exhaust/vent screen, the fender braces, and the small channels that fit in front of the driver's compartment. Perhaps these are to prevent ricochets from bouncing off the glacis and into the driver's face. Also included are the usual tools that one finds on the fenders and a driving light. The welded turret is in two halves with separate crew hatches, though these and other hatches are to be modeled closed as there is no interior detail. The gun barrel is a single molded and the area around the turret seems appropriately busy . As many of you might guess, this kit is almost identical to the Mod 1935 released earlier aside from not having the welded turret. 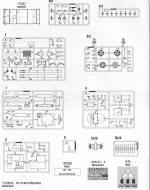 Instructions are well drawn with clear construction steps. At the end of the steps are several full tank drawings so you can be sure you got all the bits in the right place. Unsurprisingly, no color information is supplied in the main instructions. A full color painting and markings guide is provided for two vehicle. One is the box art vehicle in overall green, though shown with a winter wash in the painting diagram. The other is a mixture of green, reddish brown and winter wash. This second option has no markings. 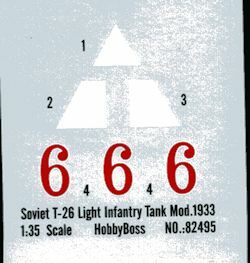 As is the norm in many cases, no unit info is provided, but it is obvious both are tanks are soviet. The decal sheet is nicely done. The patchiness is due to my aging scanner not liking light blue. While not the first T-26 to be kitted in this scale, it is probably the best in terms of accuracy and ease of construction. Some may shy away from the separate track links, but from the look of it, this would be one of the more hassle-free methods and well worth a go.